Adera Windows & Doors was born out of a culmination of over 15 years of construction experience - specializing in windows and doors. Adera strives to source and supply and install top quality window and door products to homeowners, builders, and property managers. Our centrally located showroom in the heart of Kelowna allows us to service the entire Okanagan efficiently. We have supplied and installed thousands of windows & doors all over the Okanagan and BC Interior and we would be delighted to help you with your next project. Please give us a call today! Adera Windows And Doors Inc is rated 3.0 out of 5 by 2. Rated 5 out of 5 by Betty B from Fabulous Company & Crew This company is awesome, from the owner to the sales person to the field manager and all the technicians. They have been freindly, curteous and punctual. We had some issues with a weekend warrior renovation by previous owners. They immediately offered to repair it and then arranged for a someone to reinstall the drywall. They nevered complained and made suggestions on how to prevent other problems from occurring in the future. Their work is excellent and the windows and doors are great. 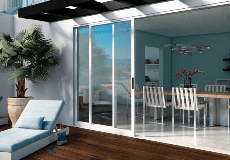 I really like the french sliding door which was offered as an upgrade to a regular sliding door. Well worth the extra money, which wasn't too much. I can't recommend this company and their products enough! By far the best contractors that we have dealt with ( and we've dealt with many over the years ) I highly recommend them!!! Rated 1 out of 5 by Morgan33 from Awful communication & constant run-around My Mom dealt with Vernon Adera and they gave her the run-around on when they could install, and when they did finally come to install a screen got wrecked by one of their employees in the process. As it was part of a set she was doing on the entire house she paid for everything. She would never receive a functional screen from Adera for which she paid. She wast told a new screen had to be ordered in and they would contact her when the replacement was ready, they never did. She made numerous attempts at communicating via email: she first made contact again 2 weeks after install, then a month after, then 2 months, 3 months after, and so it continued never getting a reply. She then had to confront the boss when he returned to the Salmon Arm Spring Home show, now 6 months after install. Finally slow communication started to happen about an order being put through, but then being returned because it was the wrong colour. It has now been 9 months since install and my mother finally got contacted that the screen was in, but it would be awhile before they would be be back in Salmon Arm. So she drove to Vernon to pick it up and install it herself, rather than wait longer. she discovered it was the same screen cut open on the first attempt at install. They said it would be 3 more weeks before they were in town and could "fix" the cut screen which they first claimed had to be ordered. Communication from Adera has either been non-existant or a run-around all the way through the process.